Bierhorst, D.W. 1971. Morphology of Vascular Plants. . MacMillan, New York. Esau, K. 1965. Plant Anatomy, second edition. Wiley, New York. Foster, A. and E.M. Gifford. 1974. Comparative Morphology of Vascular Plants. . Freeman, San Francisco. Raven, P.H., R.F. Evert, and H. Curtis. 1981. Biology of Plants., third edition. Worth, New York. Compared with animals, plants have a relatively simple design. Most land plants consist of a stem or axis, which functions for support and contains the conducting tissues of the plant. The stem usually supports light-gathering and photosynthetic structures called leaves (VG 1:1)(VG 1:2), and the plant's reproductive structures, which may go by the names flowers, sporangia (VG 1:3), cones, or any number of others depending on the taxon. Land plants are anchored to their substrate by roots (VG 1:4) or rhizomes, which are really underground stems. Although there are relatively few basic parts to plants, each part can take on an amazing variety of forms. Compare redwood or oak trees and the bluegrass from the surrounding lawn. Both have stems, leaves, and reproductive structures, but they look very different. The variety of stem form (woody or non-woody, densly branching or un-branched) gives plants a variety of growth forms. For example, "tree" "bush" and "herb" are important classes of growth forms. Plants with different growth forms often have different life histories and ecologies. Since life history and ecology are important features that are modified during evolution, growth form is an important feature of plants and lineages. Some plants occupy a number of growth forms depending on the conditions under which they live, or at different points in their life cycle. The terms "tree", "bush" and "herb" also have colloquial meanings that make them difficult to define precisely in a scientific sense. Parenchyma cells, the progenitor of all other cell types, are composed of thin walled, globular, more or less undifferentiated cells. Parenchyma cells comprise many soft tissues of plants (e.g., pith, cortex, leaf mesophyll, etc.). These cells also compose the horizontal rays in wood. Parenchyma cells retain the ability to divide throughout their lives, so they are important in vegetative regeneration and wound healing. For example, roots growing from a stem cutting are created and differentiate from parenchyma cells that are scattered throughout the stem and spring into action when cued by hormonal changes that a new structure is needed. Most of the "work" of plants (e.g., photosynthesis, carbohydrate storage, metabolism, secretion, and biosynthesis) occurs in parenchyma cells. As parenchyma is incorporated into vascular tissue (rays in wood for example), it also helps in the movement of water and solutes throughout the plant body. Because parenchyma tissue is composed of only one cell type, parenchyma is called a simple tissue. Collenchyma tissues are composed of prismatic cells that are commonly elongated and can occur in long strands or cylinders. Like parenchyma cells, collenchyma is living at maturity. Collenchyma cells have thick primary walls composed of cellulose. (Note that you can distinguish collenchyma cells from sclerenchyma cells because of the chemical composition of their cell walls. Different biological stains are attracted to either cellulose or lignin. Consequently, in the most common stain system, cellulose stains blue or green and lignin stains reddish or pink.) Because collenchyma cell walls are not lignified, the collenchyma strands are flexible, thus ideal for structural support and protection in growing shoots or flexible structures like leaves. Collenchyma is found near the surface of cortex in stems and along the veins of leaves, where it provides structural support and protection against breakage. Sclerenchyma cells have thick, lignified secondary walls, lack cell contents at maturity, and occur throughout all plant tissues. These features make sclerenchyma tissues hard, rigid, and somewhat brittle. Sclerenchyma cells can occur as aggregates within ground tissue (sclereids or stone cells or as elongated fibers. In this context, sclerenchyma provides mechanical strength to stems (fibers in hemp and flax) and reproductive structures (the texture in pear flesh, the stony shells of nuts and cherry pits). Xylem tissue functions in both water transport and mechanical support. In non-angiosperm tracheophytes, tracheids (Figure 1.1) serve both purposes; in most angiosperms, the xylem contains both vessel elements, which have a larger diameter and are specialized for water transport, and fibers for mechanical strength. Xylem cells commonly have cell walls impregnated with lignin and reinforced with spiral or ring-like thickenings that project into the lumen of the cell (Figure 1.2). Both features reinforce the cells for mechanical support. Figure 1.1: Xylem cell types. (A) Sclereid reinforced witrh lignin; (B) tracheid of Woodwardia, a fern (one-sixth of cell shown); (C) Pinus, a conifer (one-third of cell shown); (D) fiber tracheid; (E-G) angiosperm xylem -- (E-F) tracheids, (G) vessel member. Xylem cells are dead and empty of cell contents at maturity and essentially form tubes for water transport. However, plants have no pumps to move water through these hollow tubes. Thus water molecules are pulled in long, hydrogen-bonded chains from rhizome to leaf. If the chain breaks, for example if a bubble forms in a xylem cell, the involved cells lose their function and cannot be repaired. Since xylem can be modeled as physical pipes following hydrodynamic principles, the water-transport ability of ancient plants can be easily calculated. 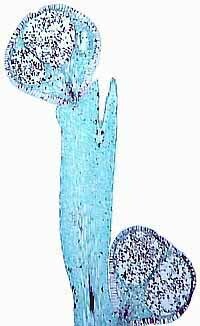 Parenchyma cells are often present in xylem tissue, where they help maintain water balance and carry out metabolism within the tissue. Because more than one cell type is present in xylem, it is called a complex tissue. Figure 1.2: Ornamentation in xylem as viewed in (A) transverse and (B) longitudinal section. Note annular, spiral, scalariform and pitted sculpture. Phloem tissue transports photosynthetic products, other organic molecules (e.g., plant hormones and waste products), and soluble nutrients throughout the plant. 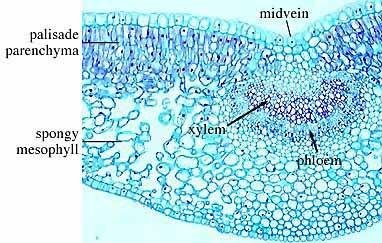 Unlike xylem, phloem is alive at maturity, but usually with a much reduced cell contents and no nucleus. This is logical because movement of material through phloem tissue relies on solute gradients and some active transport that require the activity of living cells. In non-angiosperm seed plants phloem elements consist mostly of sieve cells (Figure 1.3), while angiosperms have sieve tube cells in association with parenchymatous companion cells. Phloem fibers also provide some mechanical support. Phloem cells are commonly unlignified so they do not preserve as readily as xylem. Figure 1.3: Phloem cell types. (A) Longitudinal view of sieve-tube member and (B) sieve plate. (C-D) Sclerid reinforced with lignin. Some living land plants, namely mosses, do not contain xylem and phloem. Instead, the gametophytes of many mosses contain water conducting cells known as hydroids. Like tracheids, hydroids are elongated cells with oblique end walls, however they lack secondary ornamentation characteristic of tracheids. (Keep this fact in mind when we return to early vascular plants in a few weeks.) Also like xylem, hydroids lack cell contents at maturity and so appear empty. Some mosses also have solute-conducting leptoids surrounding a central bundle of hydroids. Leptoids are elongate cells that have nuclei and living protoplasts and thus closely resemble the most generalized phloem cells of some vascular plants. Hydroids may also be found in moss sporophytes, but leptoids have been found only in the sporophytes of a few genera. Figure 1.4: Details of conducting-tube cell wall construction. Modified from Kenrick and Crane (1997). (A) S-type cells typical of some rhyniophytes, (B) G-type cells typical of early lycopsids and zosterophylls, (C) P-type cells characteristics of Psilophyton and many common living plants. The fossil record of early land plants preserves a variety of other conducting-tube forms. Some tubes are smooth and lack ornamentation. Others have helical thickenings with a double-layer design in which a thin decay-resistant layer projects into the cell lumen and a "spongy" outer layer extends outside the cell. This S-type cell (Figure 1.4) is typical of early land plants like Rhynia. G-type cells have ring-like or reticulate thickenings in which the inner layer is decay-resistant and the outer layer is mineralized (organic material had been replaced) in most fossils. This conducting cell type is typical of zosterophylls and early lycopsids. The P-type cell has scalariform pitting typical of most modern vascular plants. The term homology was first introduced by zoologist Sir Richard Owen in 1843. The word is derived from "homologia" in Greek which means "agreement". Homology refers to structures or organs that have evolutionary correspondence, regardless of their current function. The homology of structure is based on similarities in morphology or developmental origin. The wings of birds, forelimbs of a reptile and human arms are homologous structures because they are all derived from the same primitive structure in the common ancestor of these groups. On the other hand, analogous structures may perform the same function, but are not derived from the same structure in a common ancestor. The wings of bats and insects are therefore analogous because they both function for flight, but are derived from different primitive structures. Deciding whether structures are homologous or analogous is key to interpreting evolutionary relationships among organisms. However, making this interpretation is seldom straightforward. For example, Johann Wolfgang von Goethe noted in Metamorphosis in Plants (1790) that plant organs such as cotyledons, foliage leaves, bracts, and some flower parts are variously modified leaves. Thus, these structures are homologous and we can begin to think about the transformations necessary to develop their varied forms and new functions. We might also consider the homology among conducting tubes in land plants. There is certainly a variety of form. This could be evolutionary elaboration of a single ancestral type (homology) or similar solutions to the problem of water conduction that arose independently in several lineages (analogy).